In celebration of the LGBTQ community. The rainbow colors of the LQBTQ movement is incorporated into an American flag in recognition that all Americans should enjoy equal protection and opportunity. 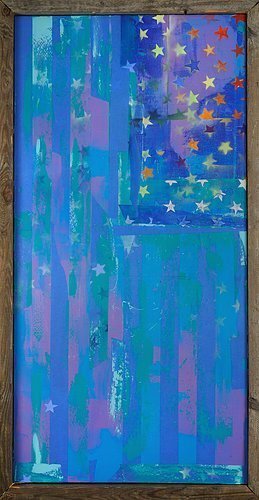 The falling stars on the flag represent the idea that no one is truly free unless everyone is, and that there continue to be threats to civil rights in the U.S.
"Painter. Photographer. Traveler. Rachael Bohlander, a painter and mixed media artist, currently resides in Washington, D.C.. Ms. Bohlander combines a legal background in international public law and public policy with a strong interest in social justice issues, to create expressive, urban-influenced works based on democratic iconography, well-known images, and photographs the artist has taken throughout D.C. and when traveling. Her use of strong colors and expressive marks is intended to promote an emotional connection and empathy from the viewer, and convey a sense of strength in diversity. Found materials, newspaper, and recycled/repurposed artwork, adds a sense of timeliness and urgency to the works, with the goal toward sparking conversation and a rethinking of assumptions regarding inequality, sexism, discrimination, and privilege. In addition to D.C., Ms. Bohlander has lived and worked in New York, New Orleans, Amsterdam, and Munich, Germany, among other cities. She has traveled extensively solo by motorcycle throughout the U.S. and India, drawing upon those experiences to inform her artwork."